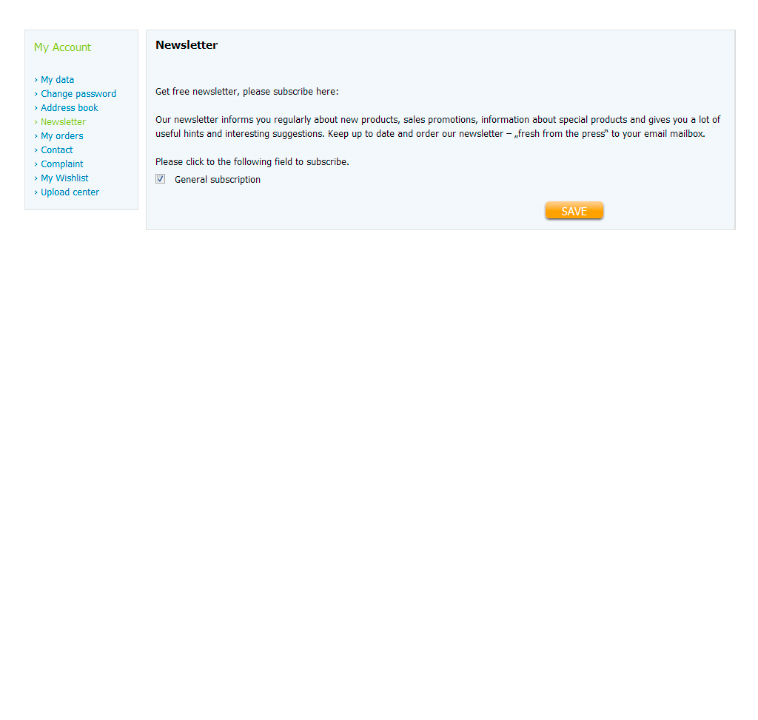 In the customer portal "My account" under "My data" you have the possibility to maintain your user account. Please ensure that the fields which are marked with the obligatory sign (*) are completed. Your data will be needed in the further ordering process for assignment and exact addressing and are subject to data protection. Please confirm the correctness of your data and save it. 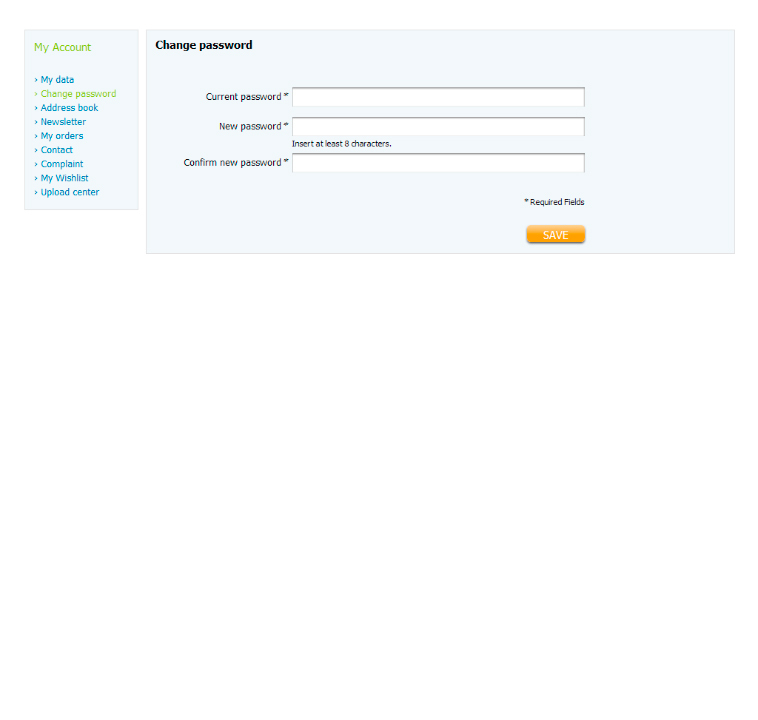 In the customer portal "My account" under "Change password" you have the possibility to change your password at any time. To do this, please enter your current password which you want to change and replace it with a new password. Finally, to prevent typing errors, confirm the new password a second time. Please note that your new password consists of at least eight characters (letters and numbers). In the "My account" customer portal under "Address book", you can edit addresses, add additional addresses, or delete them if necessary.You can also use newly added addresses as delivery, billing or sender address. 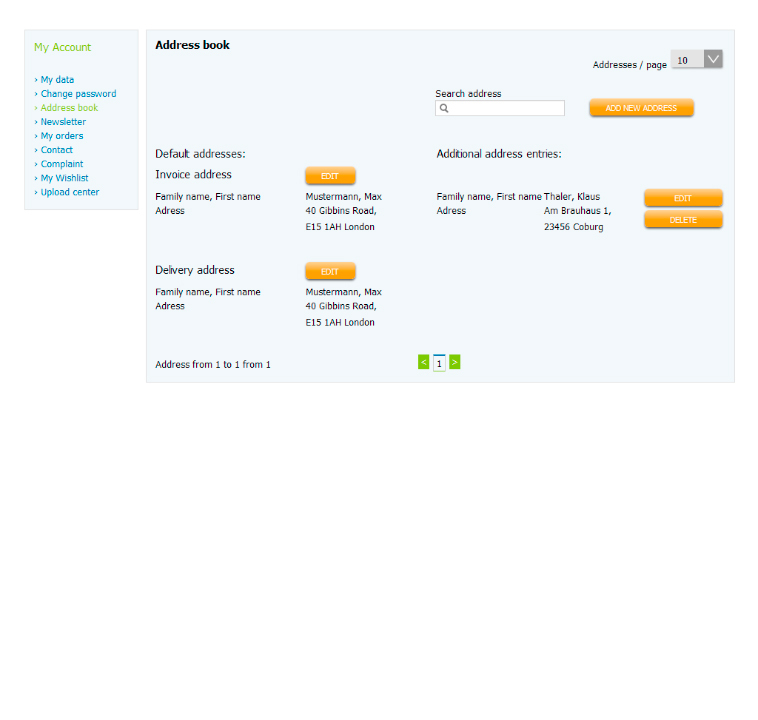 There are no restrictions in the number of addable addresses. In the customer portal "My account" under "Newsletter" there is the possibility to log on or sign out for the newsletter. Please use the checkbox to select it. The newsletter subscription is free of charge for you. 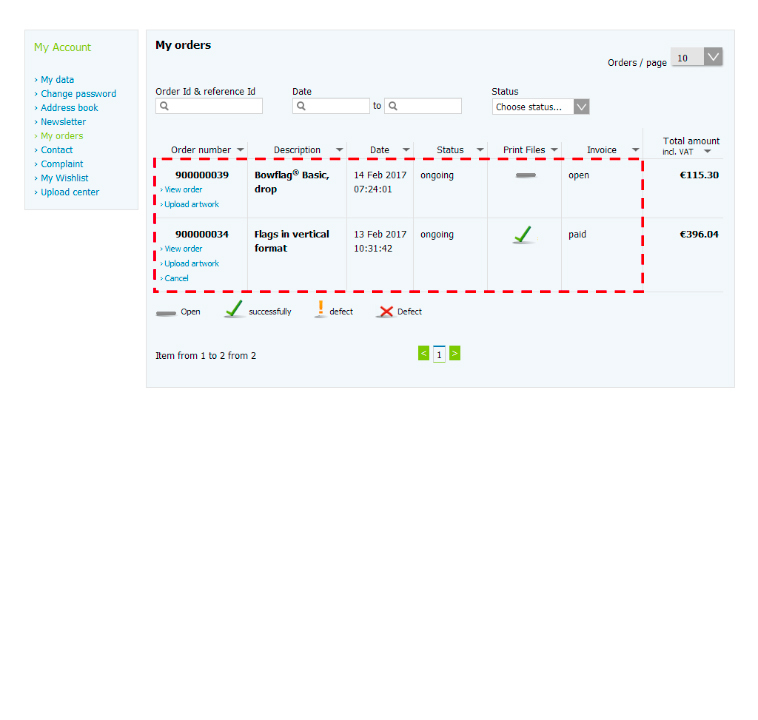 In the customer portal "My Account" under "My Orders" you can view the status of your order. 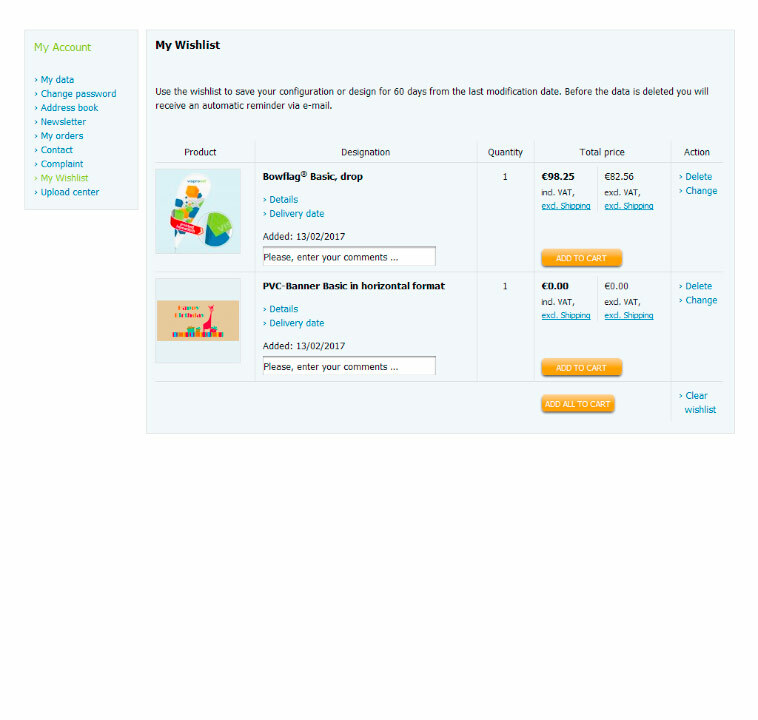 By selecting the respective order, you will go to the details page and display all the items which are contained. Here you can, among other things, "Upload delivery notes" and "repeat orders" within a period of 365 days. 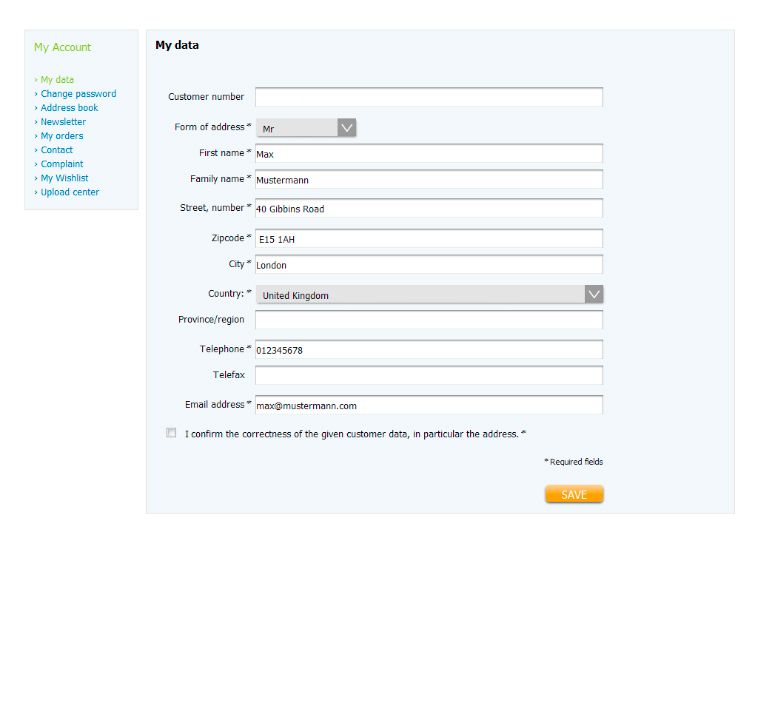 Furthermore, you can also choose "Confirm Printouts" and "Print Data" by selecting the appropriate position. In the customer portal "My account" under "Reseller" you can upload your trade licence with the help of the stored online form. Please ensure that the fields which are marked with the obligatory sign (*) are completed. After checking the registration you will receive an information by e-mail and will be released as a reseller for the purchase on account. 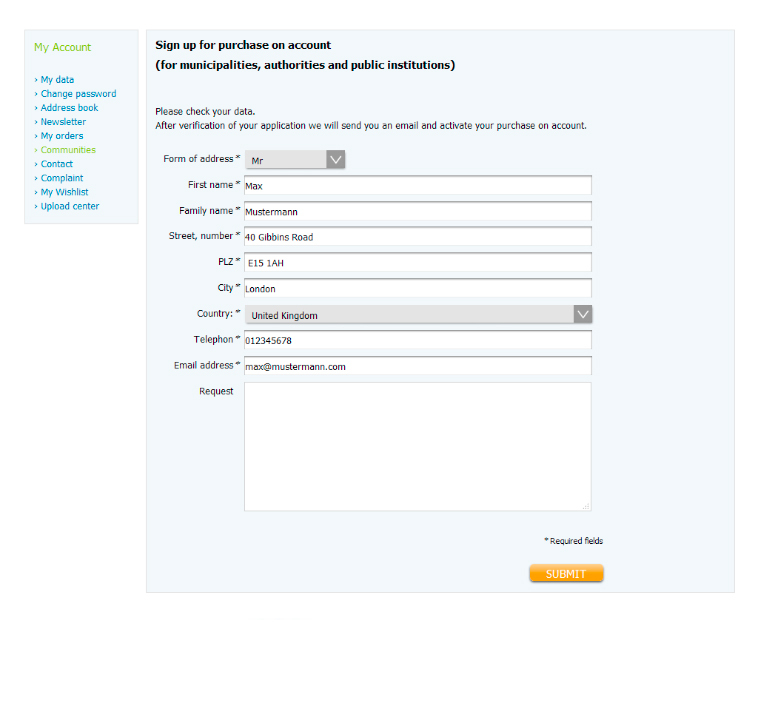 In the customer portal "My account" under "Communes", you can use the online form for the purchase on account. Please ensure that the fields which are marked with the obligatory sign (*) are completed. After checking the registration you will receive an information by e-mail. 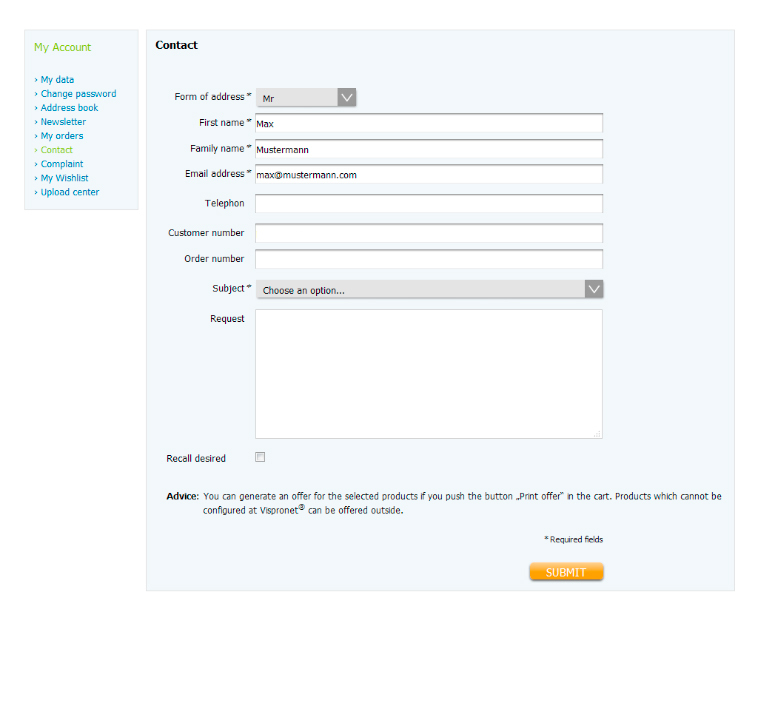 In the customer portal "My account" under "Contact" you can contact us by using the stored online form. Please ensure that the fields which are marked with the obligatory sign (*) are completed and select a subject. 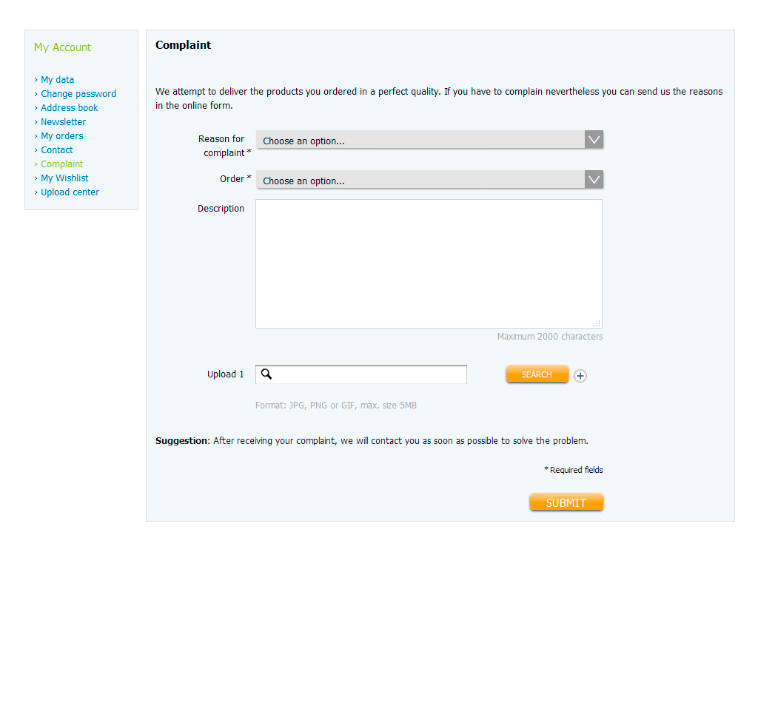 In the customer portal "My account" under "Complaint", you can send your complaints by using the stored online form. Please ensure that the fields which are marked with the obligatory sign (*) are completed. In addition, you have the possibility to upload photos of your complained goods in the file formats JPG, PNG or GIF, with a maximum size of 10 MB. In the customer portal "My account" under "My Wishlist" you have the possibility to view your favorite products in an overview. By clicking on "Saving to Wichlist" you can save your products and designs in the watch list in the product configuration process as well as on the product design page. The configuration or design is saved for 60 days from the last modification date on the watch list. 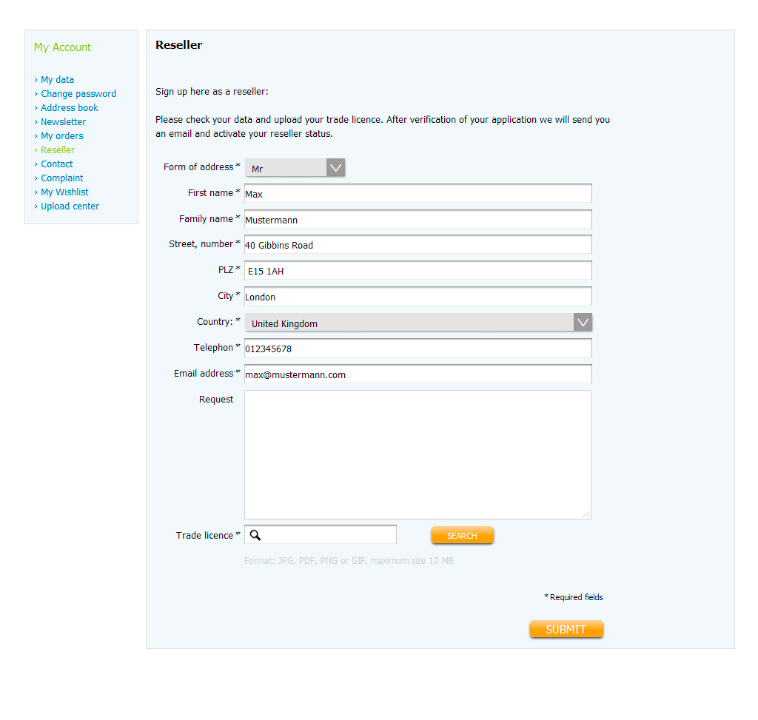 Before the data will be deleted, you receive an automatic reminder email to the email address you specified. 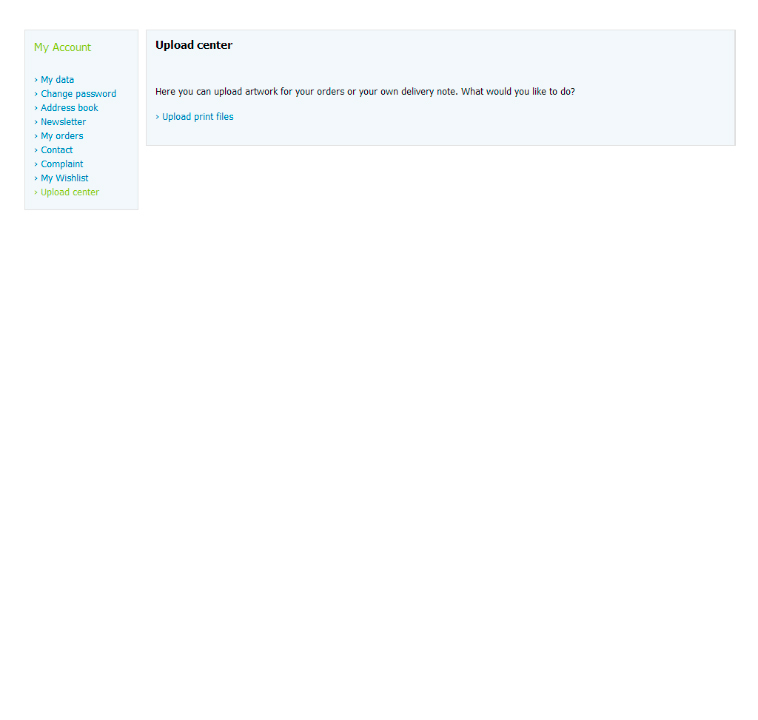 In the "My account" customer portal under "Upload center", you have the option to upload your data using "Upload print file" as well as "Upload delivery notes". Please note the legal file formats JPG, TIF and PDF as well as the maximum file size of 1 GB.